As part of the initial roll-out, ONELAN’s Reserva Room Signage range integrates with NFS’ Rendezvous Workspace room booking solution. 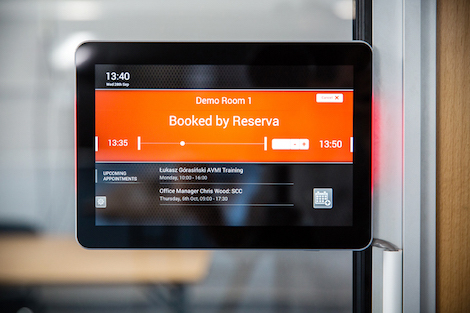 Reserva room signs display real time information for meetings scheduled in Workspace, whilst also providing an interface to book a meeting directly from the display. Where tools such as Microsoft Exchange are insufficient, Workspace enables organisations to efficiently manage meeting rooms, desks, car parking, visitor management and vended services such as catering, AV, IT and video conferencing. Jeremy Copp, CEO at ONELAN told us “We’re excited to be working with the team at NFS Technology with the partnership between Reserva and Workspace bringing a best-in-class solution to corporates. He continued, ‘With the growing demand for smarter working, room booking and room signage solutions are increasingly important to organisations looking to improve their workspace utilisation and deliver return on investment”. NFS Technology Group is a leading international provider of scheduling software and event management software solutions to help a wide range of businesses drive up the efficiency of their workspace utilisation, improving productivity and smoothing operations. Rendezvous scheduling software – which integrates seamlessly with Outlook – is used by leading law firms and major corporations in more than 25 countries for booking meeting rooms and conferences, along with video conferencing management. Reserva Room Signage and NFS will be on the ONELAN stand at #ISE2017 stand 8-F275, Hall 8. This entry was posted on Tuesday, January 31st, 2017 at 19:29 @854 and is filed under DailyDOOH Update. You can follow any responses to this entry through the RSS 2.0 feed. You can leave a response, or trackback from your own site.